It’s Tuesday 28th February, which means it’s Shrove Tuesday (or as I prefer to call it, Pancake Day!!) As a student, our skills in the kitchen tend to be quite limited so the thought of having to actually make something for yourself, that can’t just be shoved in the microwave, may seem a bit daunting. 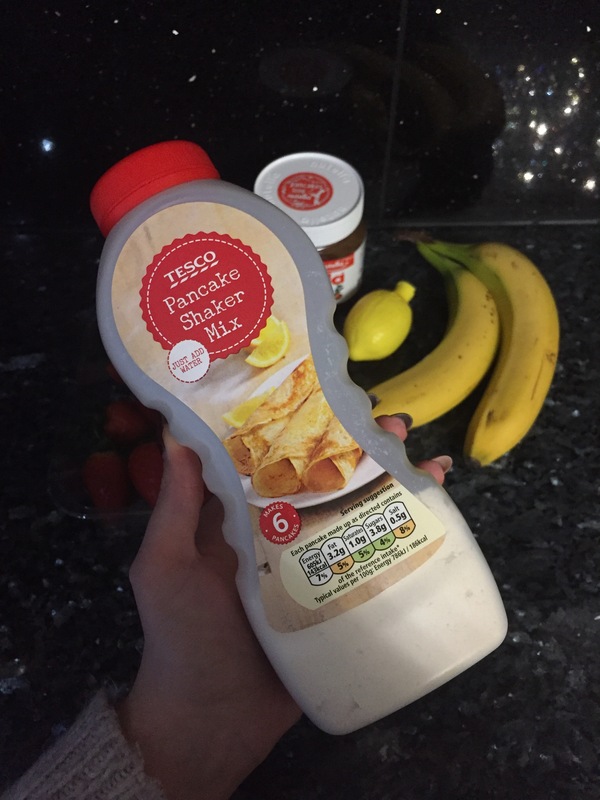 If you’re feeling lazy, all you need to do is pick up a ready-made mix from a local supermarket (like this one from Tesco), add a few easy ingredients and then you’re ready to go! They tend to be pretty cheap, and they’re super easy to use! With this kind of mix, all you have to do is add water and give it a mix. Before you know it, you’ll have a plate full of pancakes! If you enjoy thin, crepe-style pancakes then this is ideal for you. You could have them with just a little bit of sugar and lemon, or you could go all out there and have a delicious filling. Personally, my favourite is Nutella and banana, with some golden syrup drizzled over the top! Mmm. So there you have it, a quick and easy way to make some delicious pancakes! If you’re feeling adventurous, you could try out my American-style Pancake Recipe here. And if you’ve made some pancakes of your own, let me know how you got on below! Don’t forget to follow, with a new post every day at 6pm during the week and 1pm on a weekend. Oooo that’s very adventurous! I would never think to make them like that! I think I’ll have to give them a try! Thanks so much! I’m really enjoying it but have 4 essays to write at the moment, and a tonne of other stuff going on so it’s going to be a struggle over the next couple of weeks! Essays 🙂 I have a free email course on essay questions launching in the next few weeks on my blog. I’ve got an online video course on essay planning coming too – I’ll be looking for people to test it around April and potentially become affiliates. Please let me know if you would be interested. I’d love to have you onboard. Yeah I would definitely be up for trying it out! Just drop me an email or send me a message and I’ll be happy to!